I’ve used Sure Step on my original gel coat non skid surfaces and was very happy with it. My current boat was previously painted and this year I had to paint the deck with a non skid paint (Sikkens Anti-Slip Single component alkaloid enamel paint). Will I be able to use Sure Step on this painted deck? If so, how long after the paint is applied should I wait. Sikkens recommends 2 full days after application before it can be walked on. Although the coating will be stable enough to walk on after 48 hours, the solvents will continue to migrate to the surface and flash off. 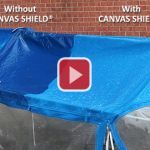 This process can last for several weeks, until the coating is completely stable. Sure Step acts as a sealant and can inhibit the flashing off of the solvents and depending on the type of solvent and the rate of release, can also destabilize the Sure Step. I suggest that you wait for a minimum of 2 to 6 weeks before applying Sure Step to a freshly painted surface to give it time to fully cure. You can also check with the paint manufacturer to find out how long before their paint is fully cured, if they’re willing to share this information. When applying Sure Step to a painted surface, clean and prep the surface with Boat Clean Plus and water only. Do not use Boat Scrub, except to remove difficult stains. Otherwise, apply Sure Step as you did before.